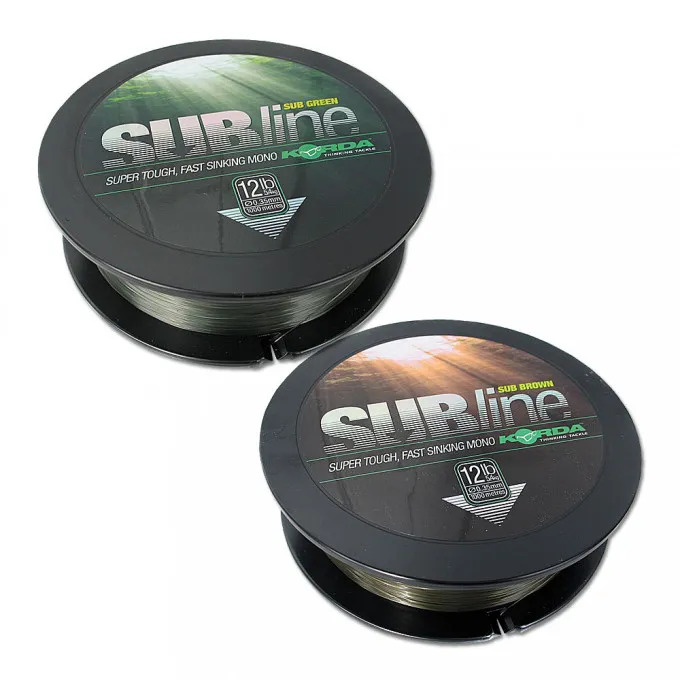 If your carp fishing, both in the UK and in continental Europe, is repeatedly plagued by heavy weed, snags, and abrasive gravel, then you’ll probably have resigned yourself to using sub-standard line which regularly lets you down on the bank. This resignation is now a thing of the past, thanks to the expert team at Korda. Korda is a brand which is committed to manufacturing innovative and highly practical tackle, allowing you to fish with confidence in a range of scenarios. This Korda Subline is one such product, designed as a direct result of an issue that many in the Korda team had been facing. As with all Korda products, this monofilament line underwent extensive product testing prior to its general release. This doesn’t just mean that the team took it out for a couple of casts before deciding that it was okay. For Korda, product testing runs over a series of years, and they experiment with each line type and each breaking strain across the seasons and in a variety of scenarios. This ensures that the end product is worthy of Korda’s impressively high reputation and the team accept nothing less than perfection from gear branded with their logo. 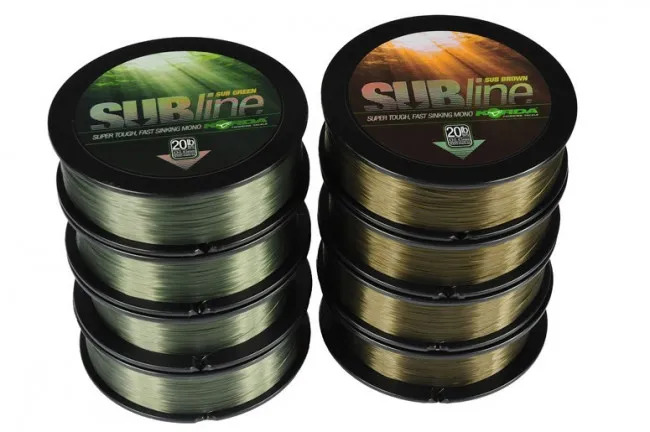 Korda Subline is the perfect option for the angler looking for a monofilament replacement mainline for their fluorocarbon line. It has been designed to be one of the fastest sinking monofilament line options available on the market, making it an exceptional option for slack line fishing. It is an incredibly supple line, despite its initial wiry feel, and many anglers have commented that they have been surprised by the line’s suppleness considering how stiff it feels to the touch. In fact, Subline is so limp that it literally hangs from your rod tip like a dead weight. Korda Subline is available in all three of the most popular breaking strains (that is to say, it is available in 10lbs, 12lbs, and 15lbs). Korda has also specially produced a 20lb option, for the angler who finds themselves contending with densely weeded water. This mainline ensures that you won’t have to worry about breakages when you’re pulling in a strong and kiting carp through snaggy waters. This also makes the line an exceptionally versatile option for the angler who regularly finds themselves on the continent, enjoying the best of the European monster carp fishing. The line is also available in two different colouring across these four strains: brown and green. This ensures that you can fish with confidence in a number of different water conditions, whether you’re fishing through dense weed or water clouded with other undergrowth, knowing that your line will be virtually invisible to the fish you’re targeting. In fact, Korda has managed to enjoy a feat not often achieved by other fishing line manufacturers; they have created a versatile line which can perform expertly across the board. Not only is this line dense and supple, but it is also exceptionally abrasion resistant. This gives it a durability not often seen in monofilament line types and it is an excellent knotting line. You won’t find yourself having to contend with nasty coils as your line spools from your reel, either. The line offers some stretch, enabling you to add a few extra inches to your mid-range casts, without being so stretchy as to lose bite indication over longer distances. Every angler who has used it has been staggered by its casting ability, and you’ll have to try it for yourself to believe it. In short, the Korda Subline is simply sublime. works well knots good cant wait to go fishing again. Use before.good product.Does what it says on the tin. Excellent line! Looks amazing on the reel and casts really well! Subline.... used it for years... excellent line. Used this on & off since it came out ultra supple & super strong one of the best lines out there. I've used it before and I am very happy with that line. Excellent, have tried several different 15lb line and this is easily the best one. Excellent service,everything I ordered came the next day,will definitely use again. the service is excellent, and very quick , never had any problems with angling direct and will keep buying from them. Excellent line for use when playing fish in weed and snags. Has'nt let me down. Decent line good in the snags. Does what it says on the can. Always get a good service and fast delivery. I have never had a problem with any goods I have bought. Will definitely use you again.